Notes: Well known plant for making sorghum syrup. 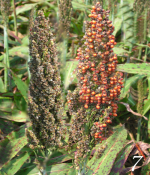 (SORGHUM BICOLOR) Sorghum is a well-known species of grain that has been used for years for human and animal consumption. It is a cane-like grass. It is one of the most drought resistant crops of all. One interesting thing is that the seed can be popped like popcorn. It is used to make sorghum syrup.